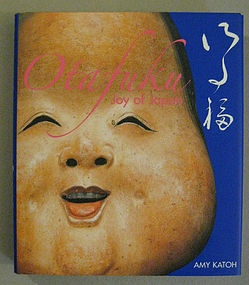 Otafuku: Joy of Japan, bu Amy Katoh. 2005, Tuttle. 192 pages. Condition=New. In English & Japanese. "Amy Katoh explores the colorful world of Otafuku. Katoh traces Otafuku's roots and folk beginnings, showing her many delightful aspects and providing a magical glimpse into this charming and little-known corner of Japanese culture that is sure to enchant readers. This book is filled with more than 100 color photos of Otafuku images selected from the collection of hundreds that Katoh has amassed over 30 years as well as treasures from museums and other collections. Otafuku: Joy of Japan presets the many faces of this archetypal figure whose many roots arise from the soul of the Japanese people."